Happy New Year - Daily / Yearly Theme! yellow tree, originally uploaded by jahansell. I'm not an official member of the Daily Photo Family anymore since I don't post regularly, but I want to join the New Year's Day fun anyway. I was pleased, looking back over this year's posts, how many candidates I had for best photo - I had stopped posting in part because I thought that the pictures were getting weaker - or I was repeating myself. But I love this tree (so much so that I made it the cover of a calendar I made to benefit the Sharon Historical Society - if you want one give them a call!) and it also relates to the discussion we've been having here recently about the shopping district. Commenters made the point that, while the plaza isn't anything wonderful, its creation is what has saved the green from commercial development. This tree is right in the middle of Upper Main, opposite the green at the center entrance off West Main. My 6 year old daughter made the definitive statement about it on the day we took this picture - walking among the leaves she said, "it's like walking through sunshine!" Happy New Year, everyone - may 2009 bring peace! Too bad you stopped posting, but I understand completely. 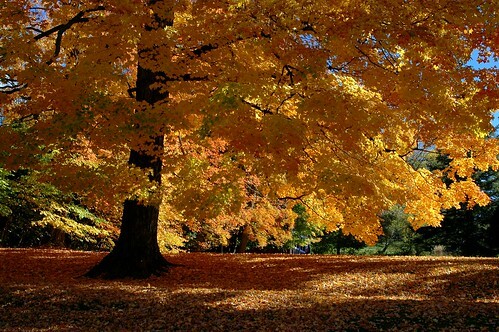 This autumn picture is simply a stunner. Best wishes in 2009! Georgeous, thanks for posting it again. I'd like to know where this notion came from that Trotta's plaza "saved the green" from commercial development. How many of the properties around the green are zoned commercial? Plus, there isn't much land available for the parking that larger commercial operations require. The Ames plaza not only "saved" downtown Amenia from commercial development, but it has turned it at various times into a near-ghost town. These plazas can cut both ways. I love this picture and your runner up from yesterday too! I love the one of the cemetery below and the second runner up too. As My Friend a beautiful photograph by this. Congratulate. Have a great year with your girls! Fabulous photo, Jenny. The light is incredible.